Even as a kid growing up in a small South Dakota town, Greg Breukelman knew he wanted a career that would make a difference. A career that could help change the world. Maybe, he figured, he’d be a teacher and coach. In college, though, Greg shifted his focus from education to business management. “I just thought it might open up more opportunities,” he says. It did. Breukelman parlayed that business background into a move to marketing and communications, and he and a partner eventually opened their own marketing agency, BKG. That relationship eventually led Jeff Broin to offer Greg the position of Senior Vice President of Communications at POET after Breukelman sold his stake in BKG. Breukelman quickly realized that POET’s innovative attitude could change the world. He knew he’d found his career calling – a career that would lead him to being an influential force in obtaining a NASCAR sponsorship to use and promote ethanol in the biggest fuel arena in America. Greg: When I was a kid, it was Richard Petty. I loved watching ABC’s “Wide World of Sports.” Later, I liked Jeff Gordon. Now, I’m a big fan of the Richard Childress drivers. Yes. I was going to ask again, so you could say Austin Dillon [who is driving the American Ethanol-sponsored car in the NASCAR Nationwide Series™]. Greg: Yes, Austin Dillon is my favorite now. He’s one of those Childress drivers. The nice thing is, American Ethanol is in the winner’s circle every single week, so we like them all. I like the new American Ethanol partnership with NASCAR®. NASCAR® is a group that wants to go fast and isn’t going to use ethanol if it doesn’t perform at 200 mph for 500 miles. Greg: We feel the same way. The strategy behind the partnership is pretty simple. The goal is to get E15 into the marketplace and make consumers feel good about buying it. E15 is not a mandate of any sort – so its success is going to come down to consumer choice and retailer choice. Messages like “energy security” and “good for the environment” and “American jobs” are all really positive, but consumer research shows that people first need to feel it’s safe for their vehicle – which of course it is. NASCAR is a perfect validator of that. With NASCAR, not only are we promoting our brand, but our product is actually part of the race… we’re blended in Sunoco Green E15. It’s been shown that the NASCAR cars perform as well if not better on that fuel under the toughest driving conditions imaginable. They have seen nothing noticeable when it comes to mileage and they’ve seen an increase in horsepower with the product. And POET’s been a big part of that. Greg: We have been involved in the effort since the very beginning, But it’s not just POET. It is an effort that goes through Growth Energy, and we have lots of other partners in the NASCAR partnership. In addition to many other ethanol producers, the National Corn Growers Association and companies, like Novozymes and New Holland Agriculture are big investors in the effort. 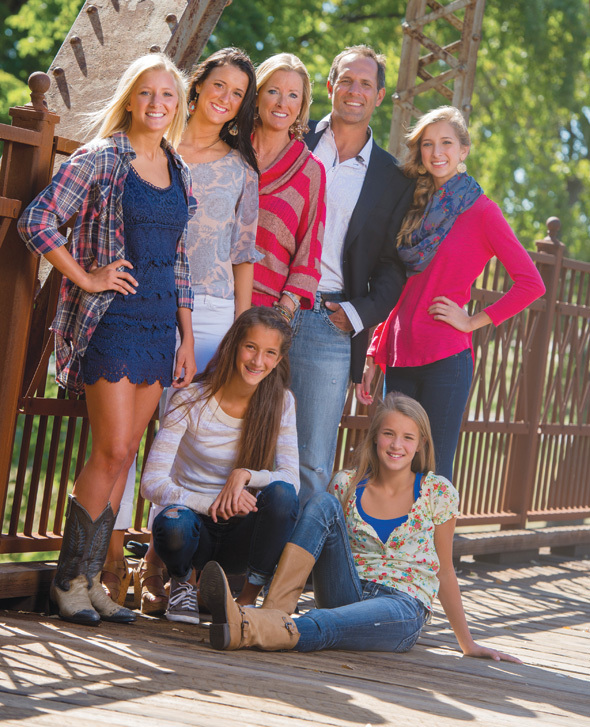 Greg: My wife, Natalie, and I have five daughters, ages 19, 17, 15, 14, and 12. Wow. There must have been a point, when your youngest was a baby, that things were crazy. Greg: At one point, we had five kids seven or younger. Greg: I had a great childhood. Awesome parents. My dad was a small-town ag banker and my mom was a stay-at-home mom. It was a good Midwestern, small-town upbringing. I was born in Platte, S.D. and went to high school in Beresford, S.D. Greg: I have three younger sisters. So, you’ve been surrounded by women all your life? Did that prepare you for having five daughters? Greg: No. I don’t know if anything does. It’s been great, though. Is communications something you’ve always been interested in? Greg: In college, I wanted to be a math teacher and football coach. Then I switched to business and graduated from the University of South Dakota  with a degree in business management. I worked for a food company out of college, and moved into the marketing and communications world there. After I left that company, a partner and I bought an advertising agency, called BKG, and ran that for about five years. Did you play football in high school? Greg: Yes. I lived in a small town, so you could be a pretty average athlete and play all the sports. I saw the impact that coaches and teachers could have on young people. Did you ever coach your daughters? Greg: I coached some of their basketball teams. Were you harder or easier on your daughters as players? Greg: Way, way harder. I would tell them “I’m going to be harder on you than the other girls, because I can.” But there were lots of tears. If I had to do it all over again, I’d do it differently. You were a South Dakota Small Businessperson of the Year in 2006. And that was also the year your company, BKG, helped play a role in deciding on the name POET? Greg: We developed the name and the brand. That was a pretty major name shift from Broin Companies to POET. Greg: Jeff Broin was really the driver behind it, and he deserves the credit. We provided the company with lots of different names. Some were more on the safe side. Some were more out there. POET was definitely one of those, but we kept coming back to it. That was the one that everybody remembered. During the naming process we interviewed lots of people at the company to try and understand the true essence of the company. We discovered a lot of innovation and creativity, so we thought POET was a unique way to marry that all together. Naming a company or a product is challenging… It’s like naming a child, but you can’t use any other name that anybody else has ever used. I think the name POET initially made a lot of people feel pretty uncomfortable, which isn’t a bad thing. I think everybody’s pretty happy about it now. Can you tell me about any of the other possible names? Greg: I don’t really remember them. POET must have been the best choice, then. You gave Neil Young a tour of the plant recently. Greg: I’m not smart enough to give anyone a tour of an ethanol plant. But I was there. Mr. Young is a very smart guy. Very knowledgeable about what’s going on in the renewable energy industries. Really down to earth. Very interested and inquisitive, and we’re looking forward to working with him. What’s the best Neil Young song ever? No. It’s “Heart of Gold.” Or “Hey Hey My My,” depending on my mood. Greg: “Old Man” is up there. What’s one thing people at work don’t know about you? Greg: I don’t know. I’m a pretty simple guy. Greg: I am pretty competitive, but people that know me probably know that. Not that I do a lot of competing, but I recently completed a Tough Mudder. Really? That looks brutal. I did the Warrior Dash last year and I thought I was going to have a heart attack. Isn’t the Tough Mudder the one where one of the obstacles is the electrical wires hanging down to shock you? Greg: Yes, you get some electricity. We did it in Somerset, Wis. It was a 12-mile course with hills and a bunch of obstacles. Greg: I love to travel. We like going to Cabo San Lucas; we do that most every year. That’s one of my favorite places. I just got back from London, and that was great. Chicago, New York, I like Las Vegas a lot. Miami. In the communications business, it has to be important to believe in the product you’re promoting. Greg: Absolutely. It’s a big part of the reason that I came here and that I’m still here today and that I hope I’ll be here for a long time. This is more than just a job or a career. This is a worthwhile cause. This is making a difference. This is the right thing for agriculture, which is important to me, and the right thing for our country, which is important to me. This is a fight worth fighting.